What is immediately clear when meeting individuals with acquired brain damage is that the patterns of communication impairments vary in remarkable ways among these individuals. 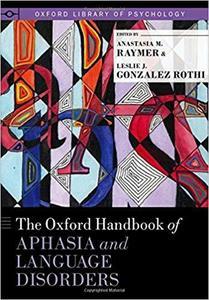 Aphasia and related communication disorders, while devastating life events for individuals who acquire brain damage, provide lessons of considerable interest to many clinicians and researchers trying to understand the brain's neurological and psychological complexity and develop methods to facilitate optimum recovery of lost language and communication functions following brain damage. The Oxford Handbook of Aphasia and Language Disorders weaves theoretical and neurological foundations with rational, motivated clinical approaches to assessment, diagnosis, and intervention for aphasia and related communication disorders. The contributing authors, experienced clinicians and scientists with strong backgrounds in neurological and cognitive neuropsychological theories, bridge theory to clinical practice, reviewing the extant literature in each aphasia syndrome while exploring implications for guiding clinical decision-making.